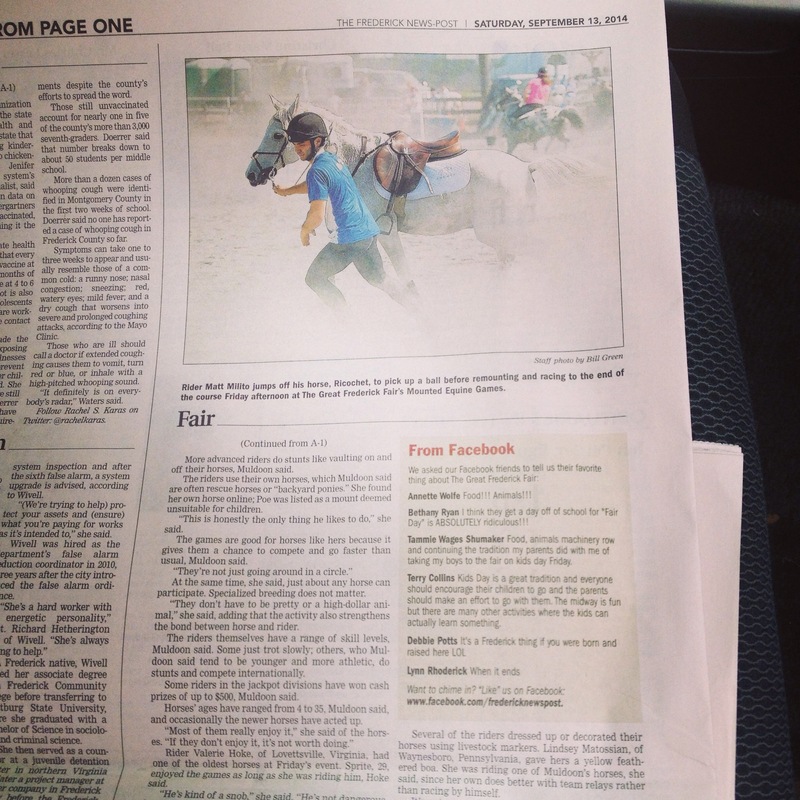 Friday was the opening day of the Great Frederick Fair, which is one of the oldest fairs in the country. This year was the 152nd year of this fair! My late grandfather told me once that when he was a kid his family would drive their wagon, sleeping under it at night, to the Frederick Fair. He grew up west of Baltimore, in the area that Rt70 now covers. MGAA has hosted an exciting mounted games individual competition on this opening day of the fair for the past few years. We host a jackpot division for both masters and our adult division riders. 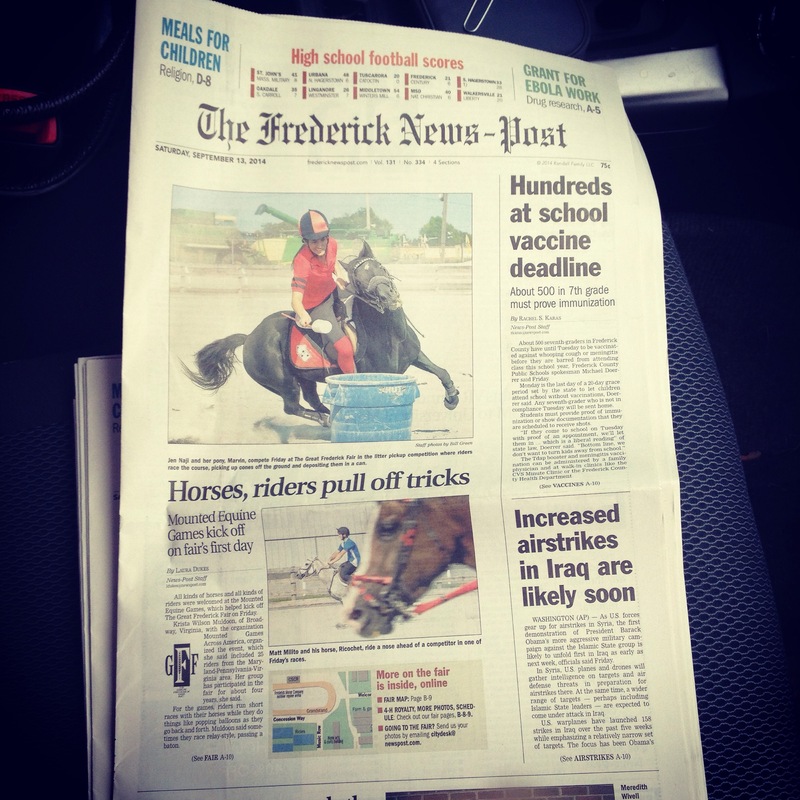 Last year we made the front page of the Frederick News Post, and we did again this year! How Exciting. Three photos total, including the top fold of the front page, and a full story. Read the story on the Frederick News Post’s website or find it pasted below. All kinds of horses and all kinds of riders were welcomed at the Mounted Equine Games, which helped kick off The Great Frederick Fair on Friday. Krista Wilson Muldoon, of Broadway, Virginia, with the organization Mounted Games Across America, organized the event, which she said included 25 riders from the Maryland-Pennsylvania-Virginia area. Her group has participated in the fair for about four years, she said. For the games, riders run short races with their horses while they do things like popping balloons as they go back and forth. Muldoon said sometimes they race relay-style, passing a baton. More advanced riders do stunts like vaulting on and off their horses, Muldoon said. The riders use their own horses, which Muldoon said are often rescue horses or “backyard ponies.” She found her own horse online; Poe was listed as a mount deemed unsuitable for children. “This is honestly the only thing he likes to do,” she said. The games are good for horses like hers because it gives them a chance to compete and go faster than usual, Muldoon said. At the same time, she said, just about any horse can participate. Specialized breeding does not matter. “They don’t have to be pretty or a high-dollar animal,” she said, adding that the activity also strengthens the bond between horse and rider. The riders themselves have a range of skill levels, Muldoon said. Some just trot slowly; others, who Muldoon said tend to be younger and more athletic, do stunts and compete internationally. Some riders in the jackpot divisions have won cash prizes of up to $500, Muldoon said. Horses’ ages have ranged from 4 to 35, Muldoon said, and occasionally the newer horses have acted up. Rider Valerie Hoke, of Lovettsville, Virginia, had one of the oldest horses at Friday’s event. Sprite, 29, enjoyed the games as long as she was riding him, Hoke said. Hoke has had Sprite since 2002; she said she received him from a friend whose son stopped riding him. Several of the riders dressed up or decorated their horses using livestock markers. Lindsey Matossian, of Waynesboro, Pennsylvania, gave hers a yellow feathered boa. She was riding one of Muldoon’s horses, she said, since her own does better with team relays rather than racing by himself. It’s not unusual to ride each other’s horses, Matossian said. Follow Laura Dukes on Twitter: @LauraDukesFNP.